So as Lil T has grown we needed a change in pushchair that we could easily fold into a small size and that would be great for on the run duties, slam it into the back of the car, pop to shops, dash out for milk/wine – etc…. Also our childminder wanted something work within her multistory carpark of buggies and pushchairs, something small when collapsed and easy to use. So we couldn’t ignore her demands any more and had to find a suitable pushchair to answer the brief. We did keep her waiting for a good few months (apologies Slavka and team). The Cuggl Hazel from Birth Pushchair from Argos has answered our every wish and been a fantastic alternative to our much loved city slicker Bugaboo Bee. So whats so good about it? 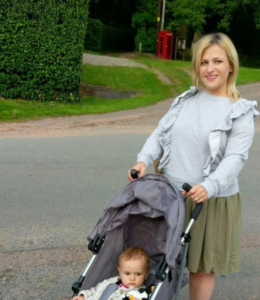 This pushchair can be used from birth, most pushchairs cant – win! It has a brilliant reclining system and a massive hood – so if the bab bab needs a nap and you are out – it is possible. I would always carry a cosy blanket underneath in the basket for extra comfy points also. The hood is a massive double win and has a little window on top, just so as you can check/stalk that the ankle biter is definitely asleep. Finally – it has padded seats for comfort and 5 point fastening harness so no slippy sliders from my little wiggle pants. Its a cost effective buy at £49.99 and will definitely be with us for a good few years to come. Bravo Cuggl.